My Words Go Here | read. write. muse. The other morning at breakfast, when I was hawkishly watching the clock, making lunches, “encouraging” the kids to hurry up, and trying to take even one sip of the coffee I poured, my six-year old son decided to initiate the talk. “Hmmm,” I said, eyeing my three-year old daughter. She was not paying attention, instead making a mush out of the eggs, waffles, cereal, and banana she insists on every morning. We really don’t have time for this, I thought. “Why do you think that?” I said instead. “Maybe it’s the magic? I mean, maybe he’s just that good at it.” I offered. Nice save. I agreed and then told him for the 1,853rd time that morning to hurry up. Logically, it doesn’t surprise me that a six-year old might start to question Santa. Emotionally, I am shocked. How is he already six? How much more time do I have? It really had not occurred to me that our Santa days might be numbered. We have an Elf. His name is Winston (after Ghostbusters) and I resent him. Last year I didn’t even pull him out of the box, but my son came home one day puzzled as to why his elf wasn’t here yet. So the elf has returned. I am frankly proud that we remember to move him at all. But O, my eternally enthusiastic first-born, wants more. He asked me the other day when his elf was going to cause mischief and make messes and you know, “do stuff”. I wanted to lie down on the floor and cry. I am not a Pinterest mom. I’m okay with that- it’s not my thing. Our tree went up the day after Thanksgiving, we listen to Christmas music every morning, and watch every Christmas show possible, and drink hot chocolate, and decorate Gingerbread houses, and on and on. I love Christmas. I’m into it. But the thought of having to be “creative” with some stuffed elf is too much for me. After a few days of watching Elf-related creative nonsense on my Facebook page and Instagram feed, I finally lost my urge to write “Barf” or “Get a life” in the comment section. I decided it couldn’t be too hard to make a little mess, so I copied some ideas. I had “Winston” pull down my son’s Halloween candy (yes, OMG, we still have his Halloween candy, I keep forgetting to throw it away). I made it look like he had spilled it everywhere and put open wrappers everywhere, and in his hands a lollipop. I have to admit, the look on Winston’s face is kinda hilarious. I made sure to only open candy that my son doesn’t like. Elf- 47. Mom- 0. I thought, you question the existence of Santa, but somehow you think this creepy stuffed doll is actually stealing your candy? But he does. He totally thinks this elf is real. ‘Tis the kind of season we are having. I’m so tired these days, a deep and lingering tiredness I haven’t felt since newborn days. I’m not sure what is causing it- I’m not getting enough sleep, but enough that I shouldn’t be this heavy. That it coincides with the busiest time of the year isn’t lost on me. Daily I think of all of the wonderful holiday-themed things I want to be doing, and then I take a nap. My plan this year (every year) was to be done shopping early December so that I could focus on the “fun” stuff- decorating cookies, wrapping presents, seeing holiday plays, making gingerbread houses, and the list goes on. Like every year, that didn’t happen. I’ve been decidedly bummed about all of this. I’m telling myself to get over it. There is only so much we can do. But I still feel a little angry about it. The weekend after Thanksgiving was unnaturally chilly and gray. We bundled up and headed out to pick out our first real tree. We wove between the majestic green giants, looking for a not-so-tall one. The smell of fir trees is intoxicating. That this kind of smell exists in our world is magic enough. We found one, pointed it out, and watched the salesman put a “sold” tag on it. Then we went to a noodle house for warm Ramen soup. Next we got hot chocolates and wandered around Toys R Us, letting the kids put things on their Christmas list. It was a perfect, unplanned, very Christmas-y kind of day. Since then, it’s climbed back into the 70’s. The days are warm and glorious, but not appropriate for picking out a tree. I keep thinking I’m so grateful I let my husband convince me to do it early, that we got that one perfect day. I always want to orchestrate the “perfect’ moments, but they usually come when you aren’t paying attention. We have a big hole in our ceiling due to a leak. The job to fix it keeps getting more complicated. My husband is too busy at work right now, working late every night, and feeling sad about missing so much time with the kids. I have a list filled with things like make cookies and donate toys that is not getting done. I rushed around the mall yesterday and ended up with eight sets of Christmas pajamas for the kids, but none of the gifts I needed. There is always stuff going on with my family, with his family, stuff too complicated to get into. My writing is slipping, I yell too much, my house is a constant mess. We have a real tree, though. And a real wreath on our front door. My husband and mother found this amazing Gingerbread candle that we light every day. The smell of Christmas is everywhere. The twinkle of our haphazardly decorated tree outshines the hole in the ceiling. Nights are chilly enough for hot chocolate and sometimes a fire. Every night we cuddle on the couch- Oliver in his plaid pajama pants and Ivy in her tacky red fake-velvet princess Christmas nightgown- and pick their Christmas book for the night from the book advent calendar I made (the one thing I did I’m proud of). It’s a mix of old and new books, and just for a moment, both of my kids are cuddled against me. Nobody is too old for anything and nobody is fighting. Everyone is simply still, listening and reading and taking it in. It’s my favorite time of the day. ‘Tis the kind of season we are having. Too busy, too tired, but sprinkled with some pretty wonderful moments. And I’ve even embraced the elf, a bit. I might think it’s ridiculous, but it brings my kids joy. So be it. Last night I wrote in red lipstick on our bathroom mirror “Eat More Sugar” (totally stolen from my friend). The kids thought it was hilarious. Our morning was filled with giggles and dancing instead of the usual grumbling and yelling. I’ll take it. Tis The Season. What kind of season are you having? What are the little things you are enjoying? I step out onto the porch, herding the kids outside to wait for their carpool. I am no longer blasted by the heat; instead, it is cool- not quite crisp, not yet, but cool enough to let me know that summer has finally moved on. I notice one of our Halloween pumpkins has melted into the step, caving in on itself. The jagged mouth has melted open, showing us the ruin within: blue and green fuzz covers the once-vibrant orange walls, and tiny flies zoom in and out. It’s di-gusting, as my daughter says. Nature is so cool, as my son says. I see them off, after too-many hugs good-bye. I hear my daughter yell from the open window, “I wuv you to infinity and beyond!”. I wave and go back inside to the house, startling in its sudden quiet. I feel the pull to the page, but first I rinse the breakfast dishes, and clean up the debris from the tornados that just left- shoes and dolls and nightgowns and t-shirts and a “map” and rocks and acorns and Legos. I walk past the tiny bathroom crouched under the stairs and notice the tulips spilling out of the vase. Yesterday the tulips were tequila sunset orange and standing tall. This morning the stalks have draped themselves over the sides of the vase like a waterfall, and the orange flowers have collapsed into a muted puddle of what they once were. It is beautiful, and creepy. Nature is so cool. I take a picture and realize I have forgotten to turn the page of the calendar. I turn the page, October rolls back and November is revealed. I walk back towards the computer, but then my husband emerges from the bathroom asking me if his tie is too much color. No, I love it, I say. Did you see that my aunt won a Country Music Award last night? No, he says, that’s awesome. I’ll watch it tonight. Oh, I say, don’t forget I have that kindergarten mom thing tonight. Ok, he says, but what if I have to get drinks with the client? As long as you are home by seven, I say. I watch him put on his tie, thinking how hot he looks. I want to wrap my arms around him and feel his stubble on my cheek. He is crisp and clean, off to be a man at work. I am disheveled and distracted, perched in my chair, still in my slippers. I have work to do too, but invisible work, at home and behind the scenes. We then discuss my daughter’s gymnastics class, our son’s plan to invite friends over for an obstacle course/police training day, dinner tonight, and his latest case. This is our moment of catching up. I go to get more coffee, glad for a few more minutes to write. Then I see the eggs on the counter, the cut-up mushrooms, the onions, the bacon, and the spinach. I forgot I was planning on cooking breakfast. I sigh, and look at the clock, and begin cracking the eggs. Finally I am here. I am out of time. But first, a few words. November. Our seasons are out of sync here. The heat of summer lingers and lingers into October. It does not get chilly until January. The November in my head and the November outside do not match up. 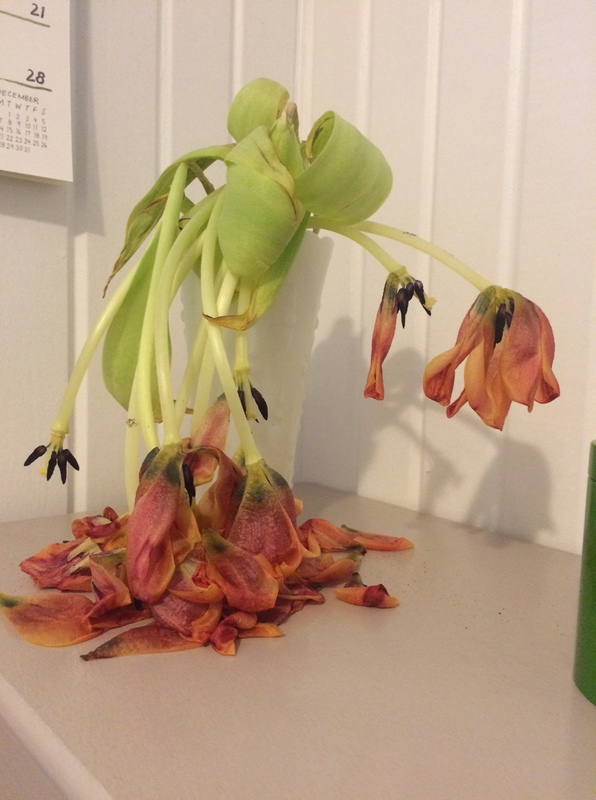 I think about the flowers- so beautiful even in their death. There is no sadness; that is the way of nature. The flowers grow and bloom into something impossibly beautiful, and then they are no more. Maybe there is no sadness because they have done their job, fulfilled their purpose, left no potential on the table. I am listening to The National on Pandora. I am filled with yearning. To write like that, someday. To reach that potential, maybe. To have my words fulfill their purpose, to match what I feel on the inside to what I say on the paper. This morning feels like a Mary Oliver poem come to life: beauty, death, nature, amazement, life small and large. All in one vase of tulips. All in one rotting pumpkin. All in one morning. I didn’t know Lisa Bonchek Adams personally; I only followed her words on her blog and Twitter. However, in that weird but wonderful way of this community, I felt like I knew her. Even though her writing focused on her metastatic cancer, even though she was very clear and direct about her prognosis, I still was stunned to hear of her death this weekend. Lisa was a force; a bold, funny, fierce, and compassionate woman. It does not seem possible that there is anything in this world capable of silencing her. I have a letter I began to her, never finished, about how her writing affected my life. Even though she wrote about dying, she taught us how to live. I wish I’d finished that letter. I wish I’d gotten the chance to let her know how much she moved me. I kept going to her site this weekend. I wasn’t sure why; nothing changed, the beautiful picture of her with the news of her death was still the only thing I saw. And then it hit me- I wanted to hear her words. I wanted to hear her view on the end, on how it felt, on her family, on what the next step was like. I wanted to hear her final wrap up, her cut-to-the-heart truth. Perhaps it is selfish, to want that. But it just seems impossible that she doesn’t get the final say. I read and copied this quote awhile back; I am not sure where I came across it. But it kept echoing in my mind this weekend, whenever I thought about Lisa. In honor of Lisa: please make your doctor appointments. Find a bit of beauty in the world, and share it. And consider donating to her research fund.